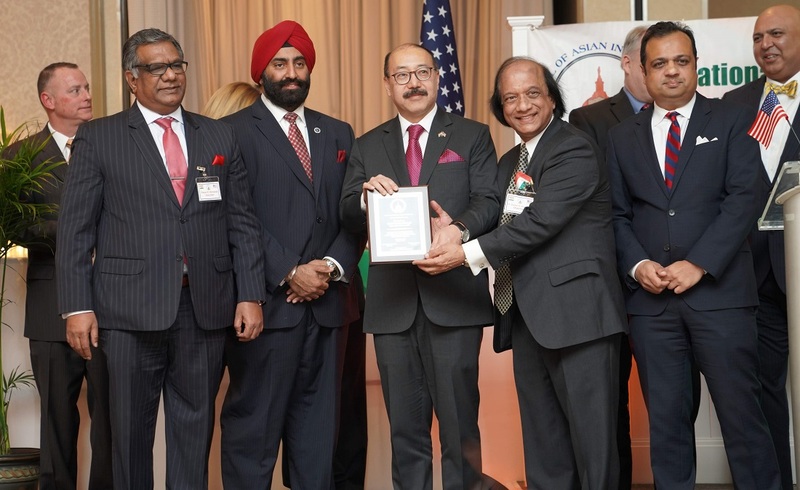 Indian Ambassador to the United States Harsh Vardhan Shringla receiving a welcome citation from NCAIA Chairman Dr. Suresh Gupta. Shringla, MD Secretary of Commerce Kelly Schulz and Montgomery County Executive Marc Elrich attend NCAIA Republic Day celebrations. India and the United States, two democracies that did not have the best of relations for four decades during the Cold War, have since made up for the lost time, said Harsh Vardhan Shringla, India’s ambassador to the United States, on Saturday. India and the United States “should have been kindred nations from the time of our Independence in 1947,” as they share similar values and principles as democracies, he said delivering the keynote address at an event hosted by the National Council of Asian Indian Associations, in Greenbelt, MD, to celebrate India’s 70th Republic Day. The event, which was held in association with the Sikhs of America, was Shringla’s first major public community event outside of the Embassy of India after assuming charge as India’s 26th ambassador to the United States. The diplomat, who was introduced by Sikhs of America Chairman Jasse Singh, was also given a welcome reception. Shringla, who presented credentials to President Donald Trump on January 11, also praised the role played by the Indian American community in improving and strengthening the bilateral relations. “[The India-US relations] have come a long way but there is one important factor that has contributed to the relationship being where it is, and that is the contribution to the Indian American community,” he said. Besides the Indian diplomat, a number of top officials from Maryland and the Washington, DC, area, as well as local Indian American community leaders attended the Republic Day event. Among the speakers were newly elected Montgomery County Executive Marc Elrich; Maryland Secretary of Commerce Kelly Schulz; and Steven McAdams, Executive Director of the Maryland Governor’s Office of Community Initiatives. Both Schulz, a Republican, and Elrich, a Democrat, expressed their appreciation for the Indian American community and the relations with India. Elrich, a lifelong civil rights activist, described India’s independence movement as a inspiration for all the decolonization movements of the 1950s and 1960s in different parts of the world. He also cited the Montgomery County’s business ties with India. The NCAIA also honored Shringla, Schulz and Elrich at the event. Other speakers included NCAIA Chairman Dr. Suresh Gupta and the organization’s President Pavan Bezwada. In his welcome remarks, Bezwada pointed out that five NCAIA members serve on various commissions of the Maryland governor. Deputy Chief of Mission at the Embassy of India Santosh Jha, Dr. Jaideep Nair, Minister (Consular Services) at the embassy, and Senior Vice President for Academic Affairs at Montgomery College Dr. Sanjay Rai were among other dignitaries who attended the event. The truth is, US has kicked out her old boy friend Pakistan and replaced it with India to subdue China. Tomorrow if USA find out a better suitor India would meet the same fate. There is no permanent friend or enemy but everlasting interest for a nation, hope Shringla knows it. “We had values that could have taken us forward, but I think we made up for lost time, and in the last decade or decade and a half, we have come a very long way,” said Shringla. But what are those special common values that India has with USA? Except flawed democracy what is the similarity between USA and India?